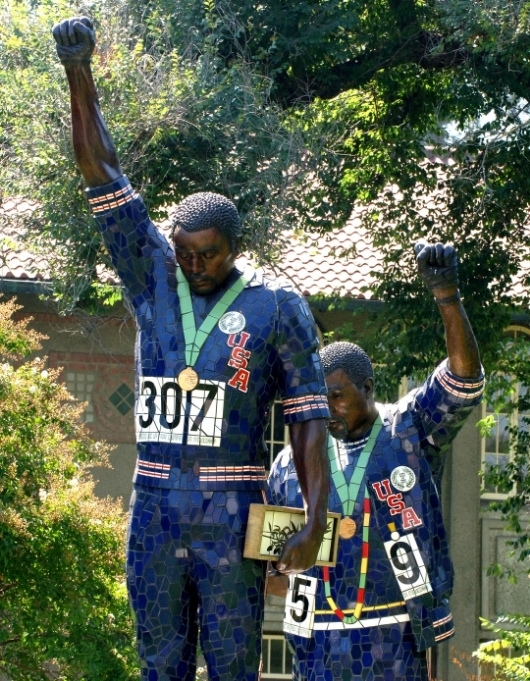 The campus ignites Wednesday, when 1968 Olympic Games bronze medalist John Carlos will deliver the keynote address for Legacy Week at the sculpture commemorating his stand for human rights. SAN JOSE, Calif. – The Associated Students Cesar Chavez Community Action Center (CCCAC) presents the Seventh Annual Legacy Week at San Jose State starting Monday, Oct. 15. The campus ignites on Wednesday during the annual Legacy Rally, where 1968 Olympic Games bronze medalist Dr. John Carlos is set to deliver the keynote speech at noon. After the rally, students and the community are invited take a group photo with Carlos at the Smith/Carlos sculpture, which was unveiled in 2005 to commemorate their legacies. 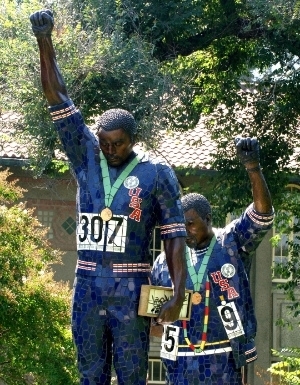 Over four decades ago, John Carlos and gold medalist Tommie Smith, both Spartans, raised their fists and bowed their heads in front of the world on the Olympic stage in Mexico City as the National Anthem played, representing their fight for freedom, equal rights, and unity. It was one of the most controversial and powerful moments in history, creating an image that will forever symbolize the American civil rights movement. Monday kicks off Legacy Week at the Legacy Wall in front of Clark Hall, where students can make and hang posters representing their passion for various human rights issues, and the week continues with a series of film screenings, community debates, and teach-ins. The week wraps up with the annual Poverty Under the Stars event, where students are invited to sleep out at the statue in solidarity with those less fortunate. Due to the high demand of Legacy t-shirts in 2011, this year the CCCAC is launching a new Legacy Line of clothing and merchandise with a new look at the well-known image of Smith and Carlos in blue and gold. Legacy shirts will be available in the SJSU bookstore throughout October, and a percentage of the proceeds directly supporting the CCCAC and future programs. Associated Students, whose mission is to represent the students of SJSU and continually improve the quality of their educational opportunities and experiences, is bringing Carlos to campus to honor the work of all student activists and community leaders and to give students the unique opportunity to meet one of the most well-known alumni of San Jose State. For more information about Associated Students, Legacy Week, or other programs of the CCCAC, please visit the A.S. website. Legacy Wall Poster Making/Hanging, noon – 5 p.m. at the sculpture: Students can make a Legacy poster (8 1/2” by 11” up to 4′ by 4′) that addresses one of the sculpture themes, such as racism, sexism, oppression, poverty, human rights, equality or peace and nonviolence. Film Screening, “Fists of Freedom: The Story of the ’68 Summer Games”, noon to 3 p.m. at MOSAIC in the Student Union. Documentary film leading up to, during and after the 1968 Summer Olympic Games in Mexico City. Features interviews with athletes, including John Carlos, Tommie Smith and George Foreman, activist Dr. Harry Edwards, journalists and archival footage of the games and the fallout after Carlos and Smith took a stand for human rights. Running time one hour. Measure D and Prop. 30 Teach-in, 9 – 10:15 a.m.
Propositions 34, 35, and 36 Teach-in, 1:30 – 2:45 p.m.
Measure D & Prop. 30 Community Debate, 7 – 9 p.m. Poverty Under the Stars, 6 p.m. – 9 a.m. at the Smith/Carlos Sculpture. Tent set-up Noon. A seventh annual event where students sleep out in solidarity with people who are in poverty. This year, the event will focus on minimum wage workers. Contact Elisha St. Laurent at elishastlaurent@gmail.com if students want to sleep out. Students can also just attend the 6 – 8 p.m. event that will feature guest speakers, an improv play, spoken word, and a movie. That’s only one part of the school’s legacy. Why doesn’t the school also recognize it’s legacy as the founding Cal State campus?